I know multiple moms that do this and they absolutely love it. Not only can you bring your kids on the bus with you (and if you need to a job you can bring your baby to, you just hook their car seat up behind you), but you also get really nice part time hours. Basically, 2-3 hours in the morning and 2-3 hours in the afternoon. On top of that, most of the kids you are transporting will be so excited about a little baby or toddler that they’ll keep them entertained the whole time! Oh, and did I mention you get all holidays and summers off?? Tinkergarten is a really cool program that teaches outdoor classes to young kids. If you become a Tinkergarten leader, you get to bring your kids to the classes that you teach. Since these aren’t actually school classes, you don’t need to have a background in teaching, just a love for education, children, and being outdoors! This can also be a really flexible option since the classes do not need to happen everyday. TaskRabbit is another amazing company that connects people who need odd jobs done (like running errands) with people in their area that are able to do it. There are tons of opportunities on this site, but one of the biggest – and easiest to do with kids in tow – is running errands. If you’re already doing it anyways, why not also see if you can earn a little extra money doing it for other people too? 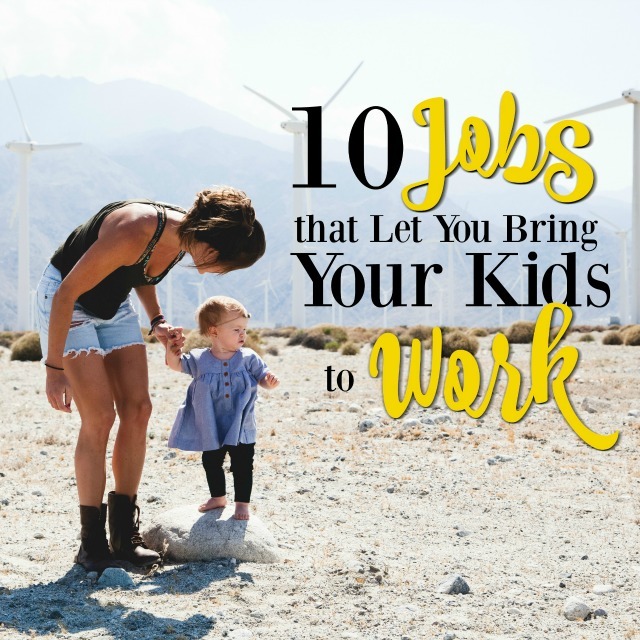 Working at a daycare is one of the more obvious bring-your-baby-to-work jobs, so if you’ve got a knack for kids, then you definitely need to consider this. Even if your baby is a different age than you are assigned to take care of, most day cares will let you enroll your kids for free as long as you’re employed. 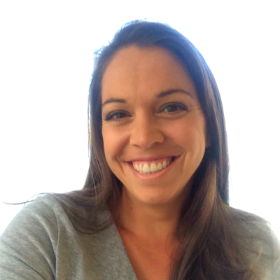 Fit4Mom is a company that provides fitness programs for moms that include their children, mostly through great workout routines that incorporate strollers. This job is really meant for the entrepreneurial-minded mom because you most likely need to start your own franchise unless you can get lucky working for a pre-existing one. But if fitness and small business are two of your passions, then this is the perfect way to bring your baby to work with you! There’s no question that freelance writing is my favorite take-your-kid-to-work job…because you basically can work from anywhere! Freelance writing is extremely flexible and while you do need to be a good writer, you don’t have to necessarily have a strong background in writing. Before I had my kids, I never would have considered myself a writer. Now, it’s what I spend most of my free time doing! Sites like Upwork.com will make it easy to find people that are looking for writers, so if you’re interested in freelance writing, give that a try. And, of course, if you want even more freedom, you can start your own blog (just like this one). Not only do you get to decide when and where you work (so that you can focus on your kids when you need to), but you also get to decide what you write about. Without a doubt, starting this blog was the best thing I did for my family! I get to take both of my kids to work and I only answer to myself. If you want to consider starting your own blog, check out the post below for all the details you need. There are so many great ways to make money as a photographer, but the ability to bring your kids with you on photo shoots is what really excites me about this job. For my son’s first birthday, we hired a photographer to capture some great memories for us and she brought her kids along for the event. You know what happened? Her kids stood behind her making my son smile and laugh for the pictures! They distracted him while we were freshening up. And when they weren’t being helpful, they were enjoying themselves on the sidelines! It was the best of both worlds and totally opened my eyes up to the amazing potential photography holds for parents who need to take their kids to work with them. Virtual assistants are basically the modern day administrative assistant, only all of your work is done from home. It’s also way more flexible and depending on the work you take, you may be able to set your own hours (which means you can keep your work hours to when your kids are sleeping!). Virtual assistants do everything from social media management (want to make Pinterest your job?) to cold calling and email correspondences. Basically, anything that can be done online is now usually done by a virtual assistant. Website design is another amazing opportunity for working from home while you’re also with your kids. If you have a knack for design, then you’ll be blown away by all of the website design jobs out there. Every small business that exists is basically in need of a website designer, so there’s a constant pool of new work. You can also decide when you get your work done (nap time!) and how much work you want to take on. Let me know if you’ve got another great job that lets you take your kids or baby to work! I’m always on the lookout for new ideas. 🙂 Good luck with your work! If you’d like tips on reaching financial freedom, living a fulfilled life, and raising happy kids, subscribe to MBAsahm for notifications of new posts! This list was GREAT! And really relevant for me. I do want to point out that direct sales can be opportunities, too. (I know I know… I never would’ve said this 4 months ago but I joined a company and have been able to do my parties all through Facebook and have made $300/month. Its worked for my SAHM needs. Another option is providing childcare. Care.com has so many opportunities in my area-and people will drop their child off at my house sometimes. And lastly, I just offered rides to community members to the airport – I undercut Uber by $10 and just have in a clause my kids may be in the car depending on the time. Gotten 3 bookings so far! Some online groups I am in topics like this come up all the time, what can I do from home. I think you missed the most obvious one though which is to nanny in someone’s home or take a kid into your home with you for daycare! Also working at a church, there might frequently be daycare available OR just people willing to accept that the kid comes along, office work, programs, cleaning etc.